Our range of best and budget round mirrors online let you infuse vigor to the décor of your surrounding making a subtle and refractive style statement. These mirrors lend a perfect all encompassing view which makes them one of the most sought after mirrors. Designed to perfection keeping even the minutest details in mind; these are available in highly innovative and stylish patterns. Apart from being a basic and utile object, these symmetrical mirrors can also be used for decorative purposes. Made of the best materials, you have the freedom to choose from different types of round mirrors. You can hang these decorative mirrors to perk up the beauty of your home or office décor. The amazing and highly innovative design of the entire collection will make you spoilt for choices. 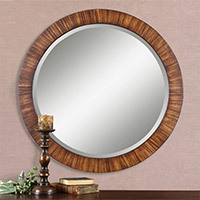 Few of the innovative and out-of-the-box round mirrors include Launa Round Silver and Antique Silver mirror. Round Mirrors There are 41 products.